A few weeks ago I met successful asset manager Christer Wachtmeister for a coffee in Stockholm. The reason for visiting him was to find out about his hobby: grape growing and winemaking in Sweden. If some years ago the idea that grapes could grow in Sweden might have seemed far-fetched, today with global warming and a thriving sparkling wine production in the United Kingdom, Swedish wine comes as no real surprise. According to the Swedish monopoly Systembolaget, it is thought that there are now approximately 40 hectares of land under vine cultivated by some 250 producers. Official figures for 2009 from the Swedish Board of Agriculture state that Sweden produced 17’859 litres of wine for commercial use (6’695 litres of red, 7’737 litres of white and 3’427 litres of rosé wine) from a vineyard area of 20 hectares. Most of the vineyards are situated in the south of the country in Skåne (the southern tip of Sweden) and on the islands of Öland and Gotland (in the Baltic sea off the south-east coast). There are a few other vineyards dotted around the country. Christer has his vineyard on the south-west coast of Sweden, in Bröddarp, on Bjärehalvön, a peninsula that juts out like a thumb towards Denmark. The area is a firm favourite of Swedes for summer holidays and has its own microclimate. Crops ripen earlier here and agricultural produce from Bjäre is synonymous with quality. SJ. When did you become interested in wine? CW. Wine is a big interest of mine. For as long as I can remember, I have always been interested in wine. SJ. What prompted you to plant a vineyard in Sweden? CW. I grew up on an estate and have a background in farming. The estate cultivated cereals, managed forest, game for shoots and housing. I later took a course in grape growing. SJ. Why Sweden? Why not make life easier for yourself and purchase a piece of land or a vineyard in France or Italy for example? CW. I am Swedish and I like to spend my free time and summers in Bjärehalvön. The important thing is to find a good site for a vineyard. Bjärehalvön is renowned for its favourable climate and early ripening crops. In fact, there are quite a few wineries close by lower down the coast in Kullahalvön. I was in between jobs and the prospect of planting a vineyard appealed to me. SJ. Did you start the project off on your own? CW. I contacted the Swedish University of Agricultural Science in Alnarp and suggested that we carry out a project together to study grape ripening in our cold climate. We picked four white grape varieties: Solaris, Ortega, Siegerrebe and Pinot Gris. Solaris, is the most planted white variety in Sweden. It is an early-ripening German hybrid that is resistant to diseases and that reaches “tooth-rottingly high sugar levels” (Robinson et al. 2012). Ortega, is a Müller-Thurgau and Siegerrebe cross created in Germany in 1948. It ripens early to high sugar levels but has low acidity. There are good examples of Ortega in the UK. Siegerrebe is a Madeleine Angevine and Savagnin Rose cross from 1929. Early budding, early ripening with low acidity and high sugar. Pinot Gris, Germany’s fourth most planted white wine variety, like the Siegerrebe is early budding and early ripening. Its acidity is moderate to low and it can ripen to high sugar levels. We planted a total of 1300 vines, 1040 of them being the four grape varieties mentioned above and the remainder a mix of red varieties including Regent, Cabernet Franc and Pinot Noir. They were planted on different areas of the vineyard using different types of soil cover: stones, woven plastic fibre (Mypex) and no cover at all. We let grass grow between the rows. We wanted to test whether either one of the soil covers would have a beneficial effect on the growth and development of the vines. We planted the vines in April 2009 and as we stand today, nearly six years later, we have not noted any marked difference. From a practical point of view leaving the soil bare is easier for maintenance. Weeds can be removed mechanically. With the stones weeds are a bit of a problem as they grow up between them and are then difficult to remove other than with a herbicide. As for the plastic cover, it is actually not that strong and gets easily perforated. SJ. How well did the different grape varieties do? CW. Solaris is clearly the most resistant to frost and is reliable in terms of production. Even during a bad year – such as two years ago – we had a good harvest of Solaris. Pinot Gris does not do as well in particularly cold years. SJ. How resistant to disease are the grape varieties? CW. Siegerrebe, Ortega and Pinot Gris have been on par for susceptibility to Downy mildew and Botrytis (grey mould). Solaris and Ortega proved to be the most resistant to Powdery mildew and Siegerrebe the least. Bjärehalvön is a big producer of potatoes. Potato growers have to treat their crops against mildew, and as the disease spreads to neighbouring crops, this means that we have to treat too. I have to treat the vines regularly and spray every two weeks from May to the end of July to protect them from Downy mildew, Powdery mildew and Botrytis. SJ. What are your main challenges? CW. Harsh winters, frost, low temperatures during the growing season. Wind is a big concern. We tried building windbreaks but they did not work and got blown down. We are going to try and plant some trees to act as wind shields. Rain during harvest is also a problem. All these factors mean that we can’t rely on having a harvest every year for the most demanding varieties. 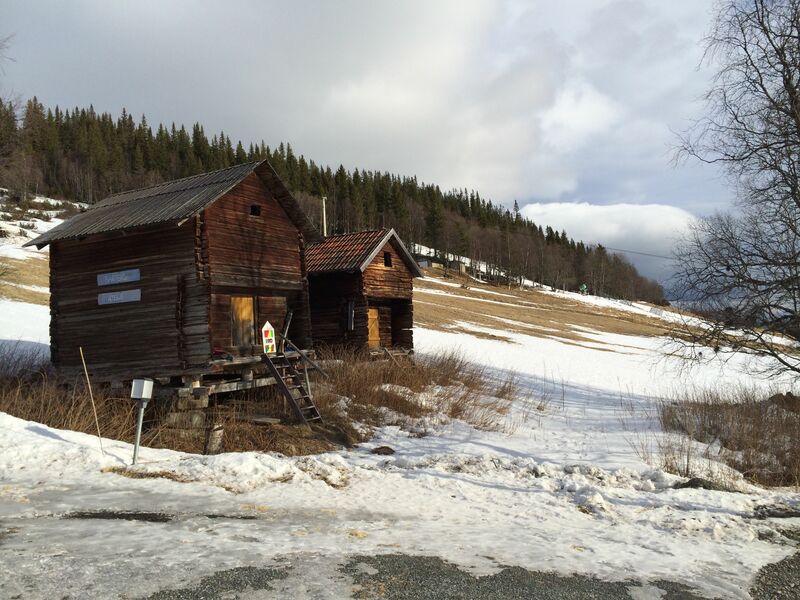 February in the Swedish mountains: where is the snow ? Global warming is a contributing factor to grape growing in Sweden. SJ. How was your last harvest? CW. Last autumn we had a very good year in terms of weather and we had our first proper harvest. Unfortunately, bees and wasps were a big problem and we lost a lot of our crop. We made 400 litres of wine from the vintage. It is going to be a big test as far as the quality is concerned. SJ. The cold weather comes in quite quickly in the autumn. Do you have to harvest early? CW. As early as possible but the berries carry on ripening throughout October, so we harvest to the end of the month. SJ. Would you be able to make ice wine here ? CW. The weather is not suitable in Bjäre for ice wine. SJ. Do grapes mature sufficiently here for the production of quality wine? CW. Yes, they do. Though chaptalisation (the addition of sugar) might be required during the winemaking process. SJ. Are you going to expand your vineyard? CW. No, I do not intend to expand. When I started out I had not foreseen how labor intensive, time consuming and costly grape growing and winemaking is! SJ. Do you believe that Sweden has a future in the production of quality wine? CW. Definitely. I feel that Bjäre is very similar to Germany and that we are following on the heels of the UK. mine’s a glass of crisp white please!